… of the season. Organized one, in any case. 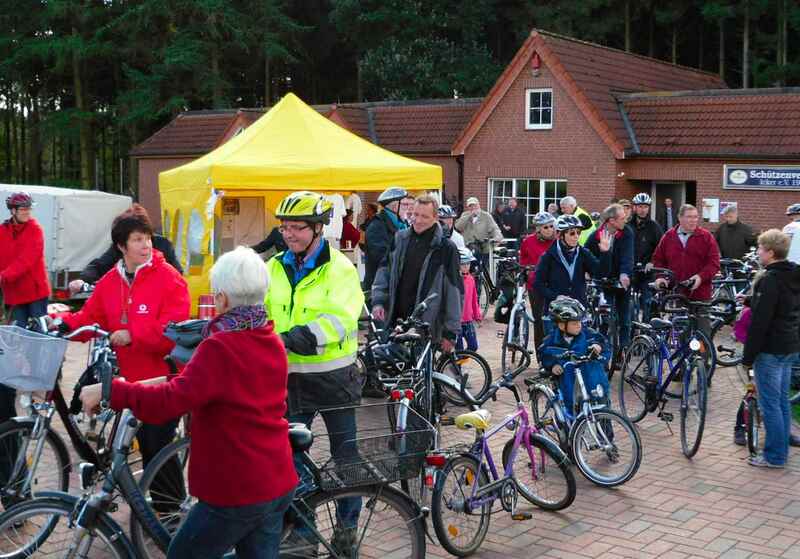 In our region the big Haltern RTF is the traditional end of season ride with roughly 1.500 attending in good weather. The ride is mostly flat with some slight undulation and very enjoyable. 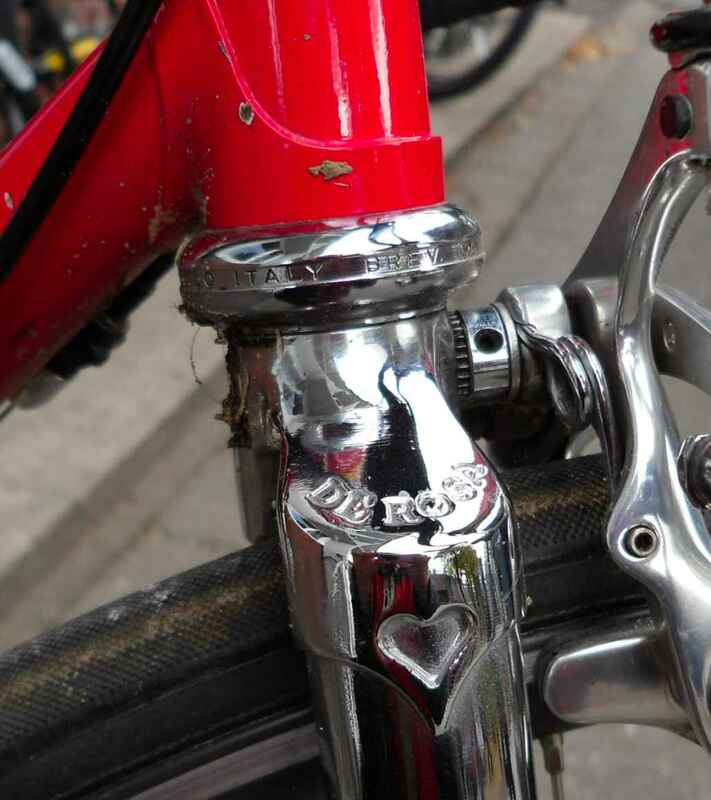 Many people bring special bikes; I took my Miele which promptly developed gear trouble forcing me to shorten the ride to about 70km which was a great shame. 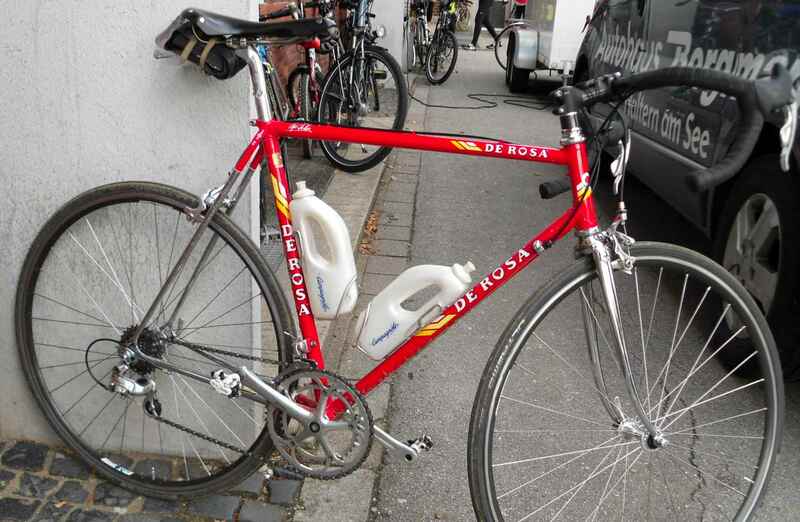 Anyway, here´s some snaps of the most special bikes I saw, starting with something competely nasty. 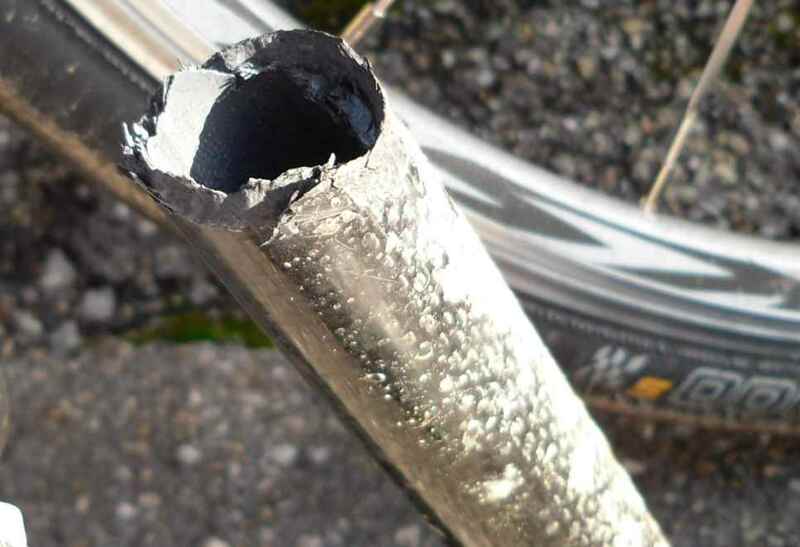 Sure, steel gives, too, but this seatpost is carbon and not steel. No idea what happened or if anyone was hurt; just saw the bike standing in the parking space waiting. On to something incongruent. 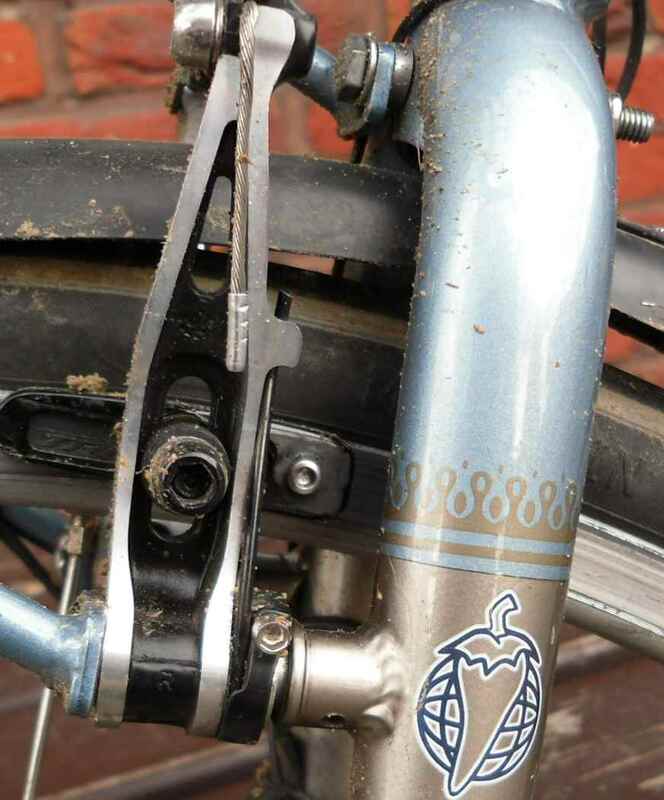 It seems this bike was built up using some nice bits on a rather simple frame with pressed steel dropouts, something in the region of a UO8. 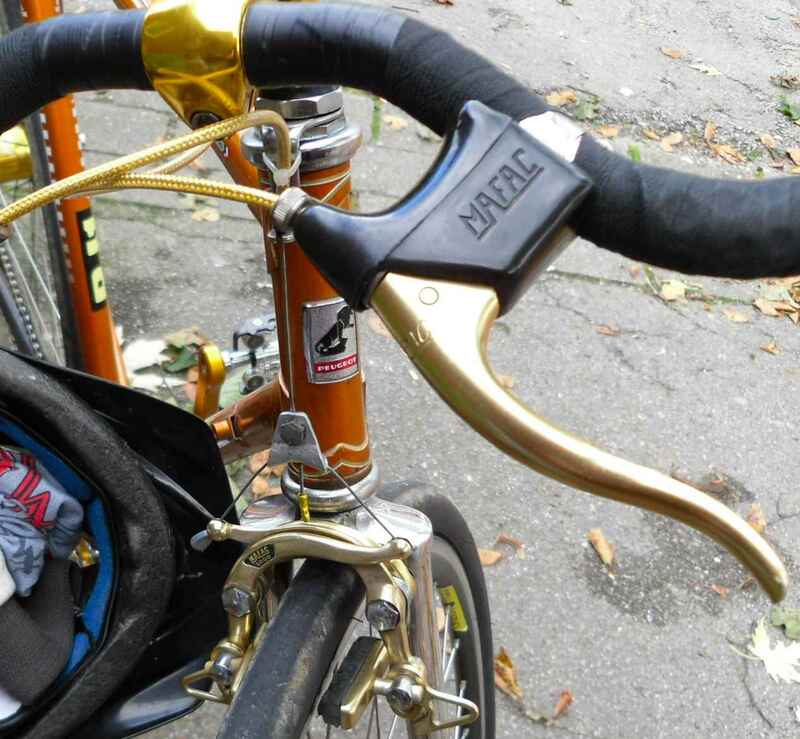 What I find a crying shame is the seemingly unreflected use of the gold anodized MAFACs. 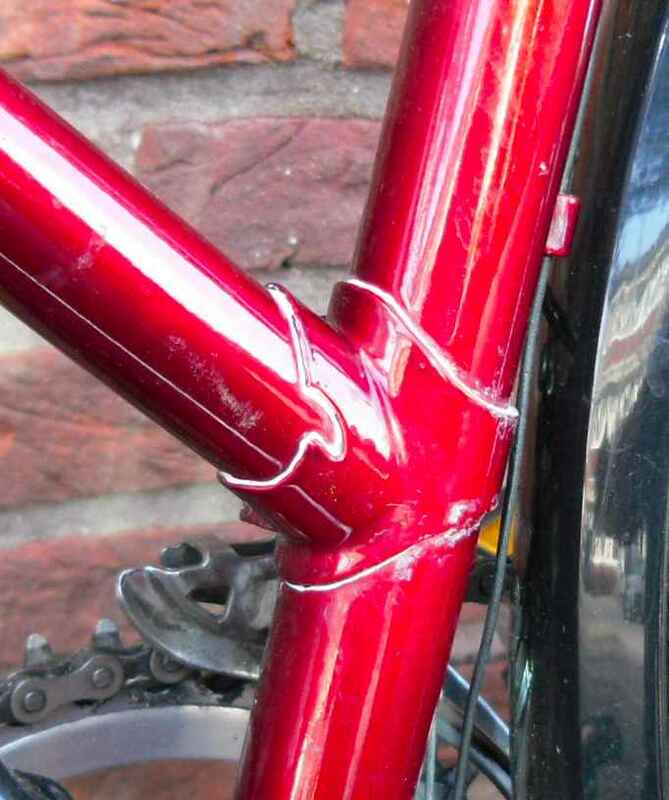 And this is what happens if the chap who powdercoats your bike frame doesn´t know what he´s doing. It´s unbelieavable what some customers will put up with. Before you start thinking up wild guesses, it´s not the one on the left. 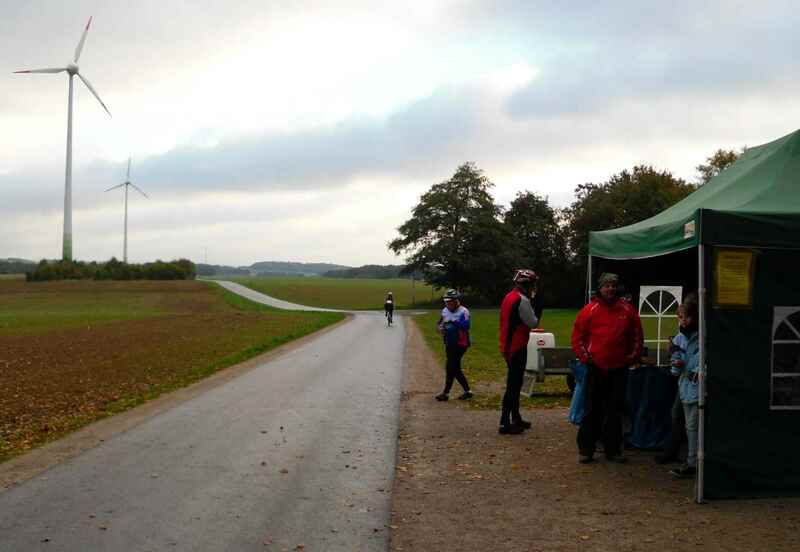 I took this photo at the first control post, with the weather deteriorating and not many riders about. The food was good, though, and the people who were there were in high spirits. The ride was more fun than it seems. The first owener must have coughed up some serious money as far as bikes go. 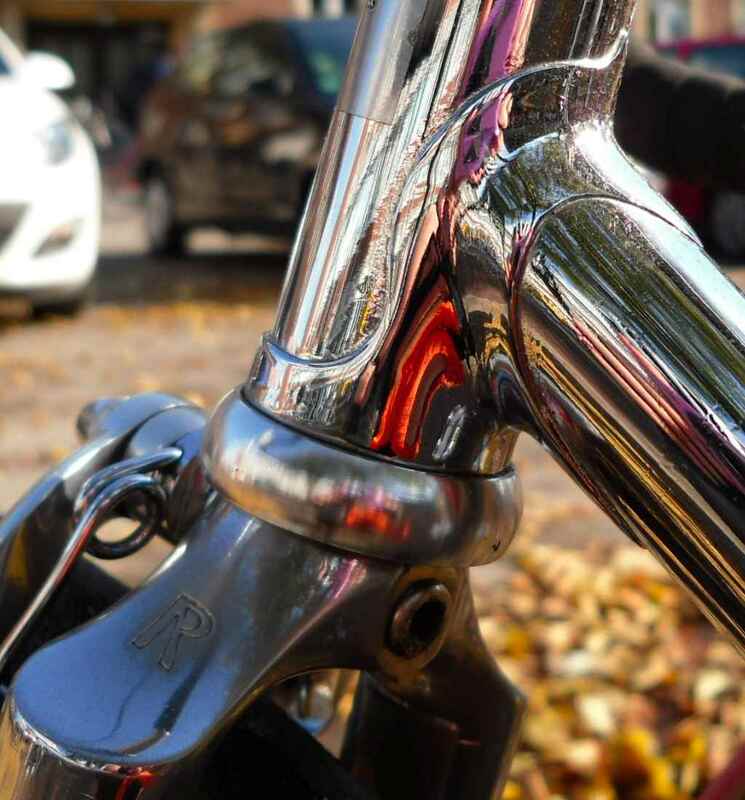 What I love about the bike is the chrome, of course, but not only the fact that the frame is fully plated, but also that the platers didn´t polish away all the details. 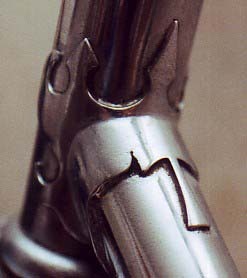 I.e., the line between fork crown and fork blade is clearly visible. 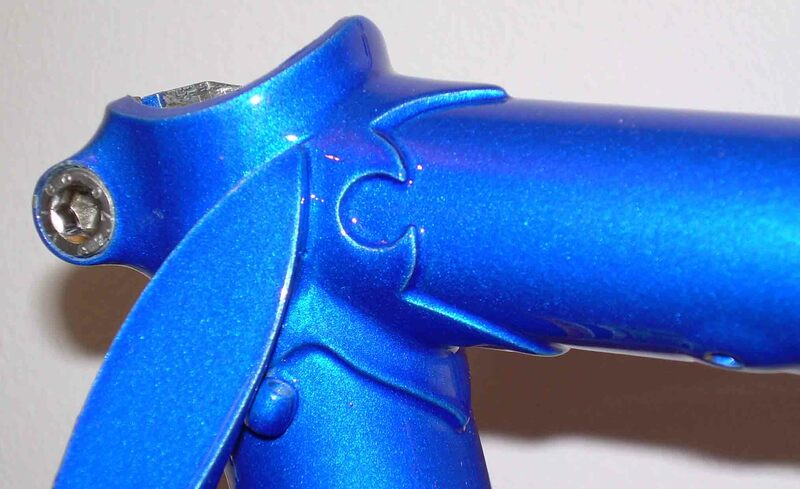 Not that I love looking at frame building flaws, if you may call the line that, but this means that other, more important details also are there, like the crisp edges on this dropout. 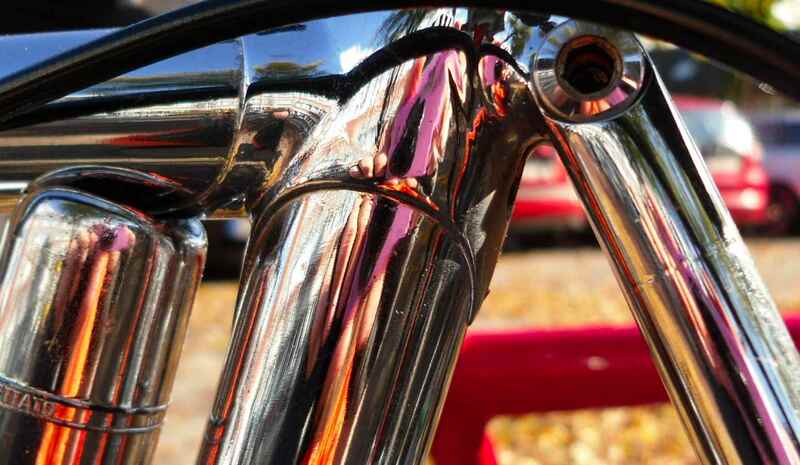 Lugs in general are filed rather nicely on this frame, and brazing seems to be impeccable. Then there was this rather rare Rickert ladies. Adorned with Nervex Série Légère Lugs it could be rather old, too. 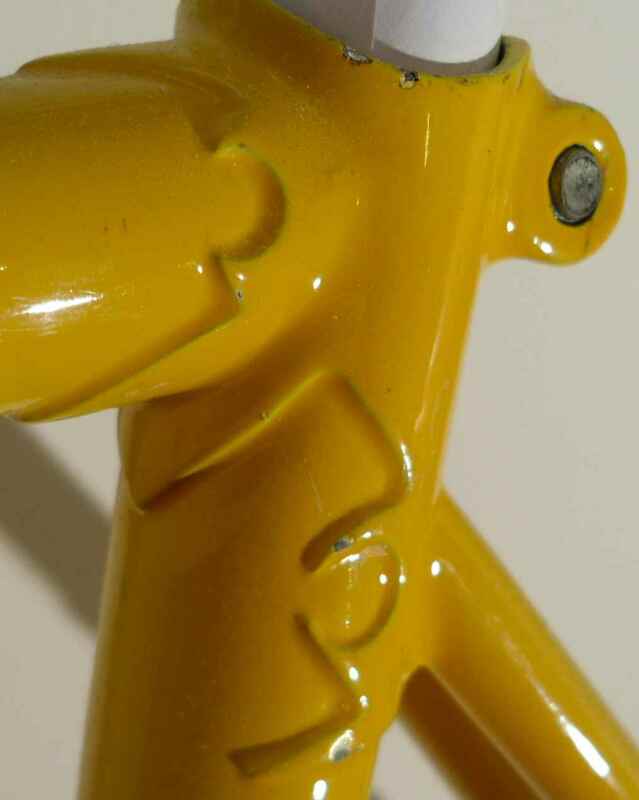 Build quality of the bike is a completely different story, though. 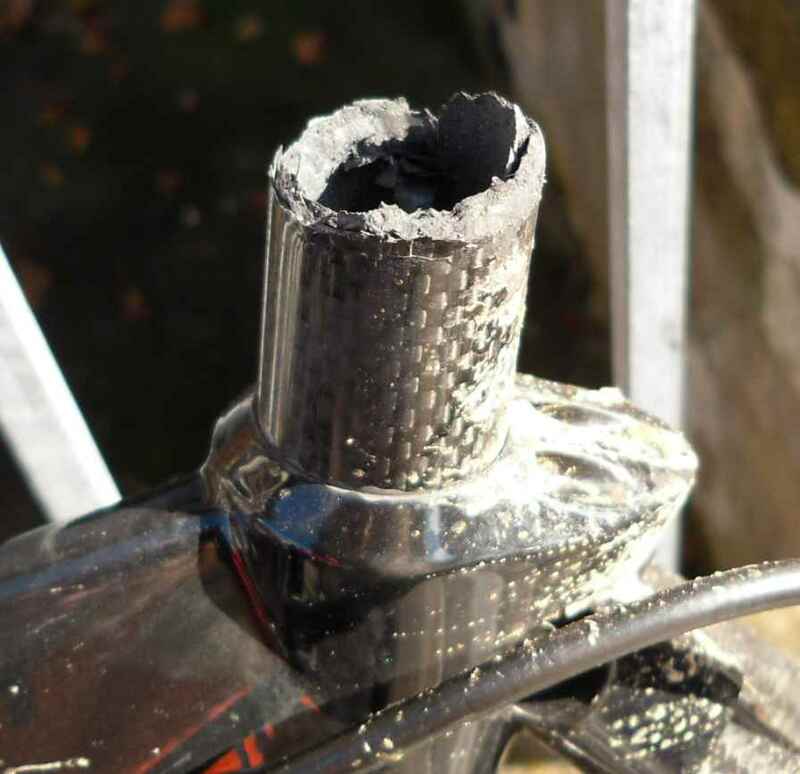 The dynamo clamp made me wince. Haltern is relatively close to Dortmund where Hugo Rickert built his bikes, so usually dozens of Rickert riders turn up, and none of their bikes are considered old steel hacks one just rides as a winter bike. 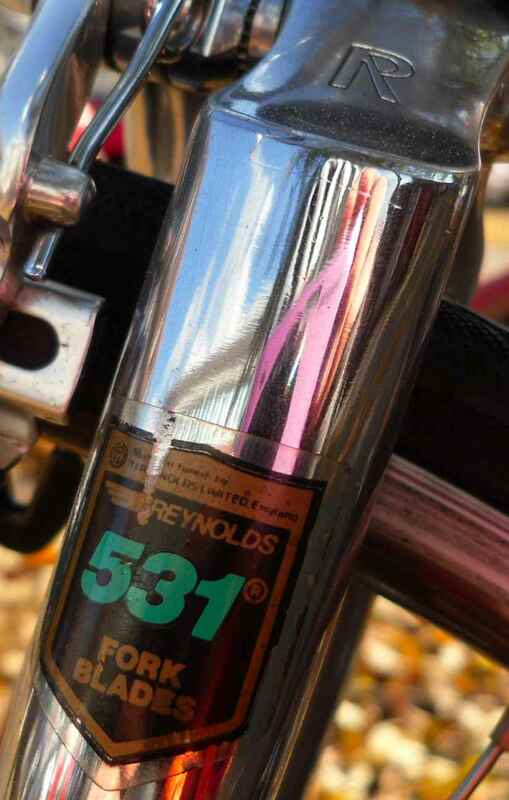 Any Rickert nowadays is something special, and riders know it. Sadly, prices often reflect this, too, if one can get hold of a frame at all. 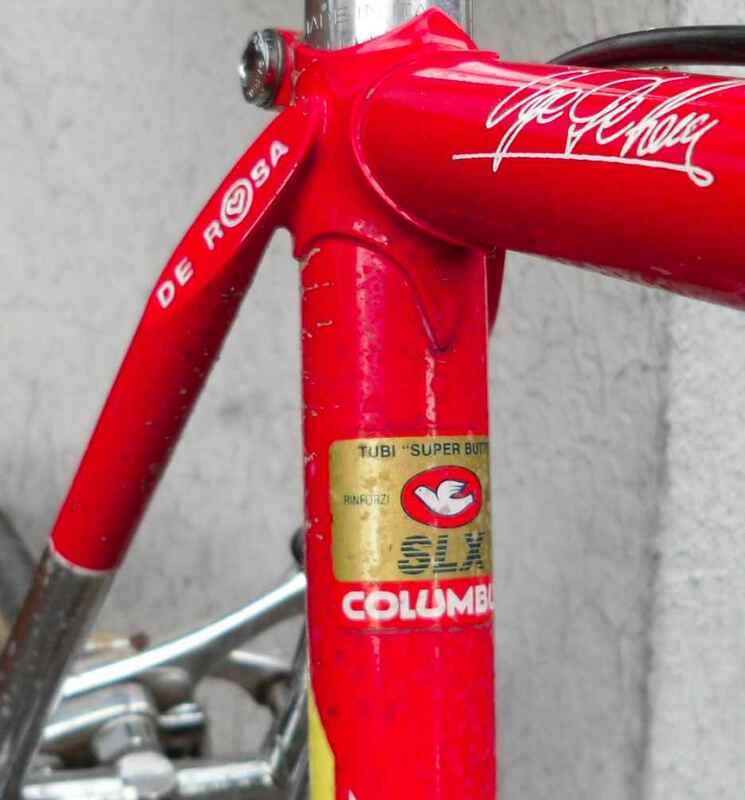 Luckily I´m settled owning the rather special tall frame I got some years ago, posted at an earlier date. 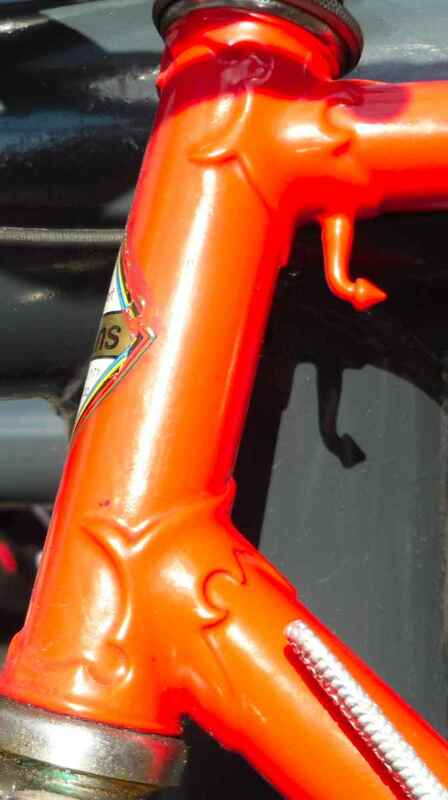 No local frame, but rather from an altogether different continent: A Salsa from QBP, St Paul, MN. 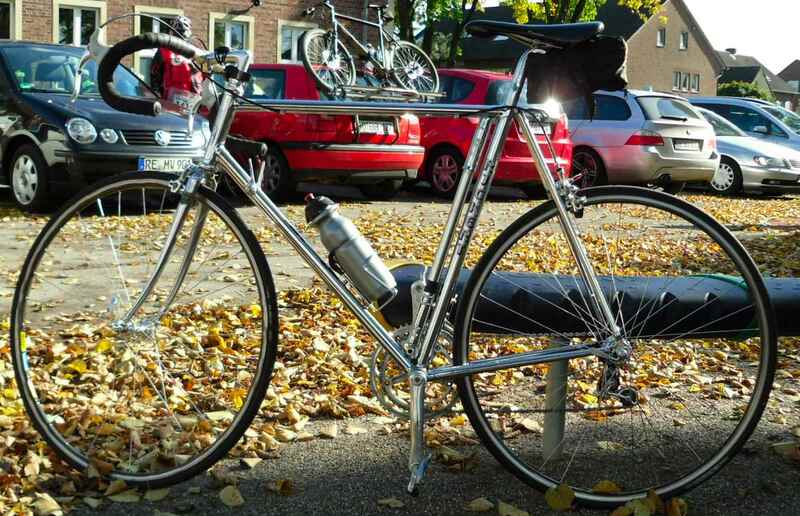 The owner, an avid randonneur, bought it in Germany. 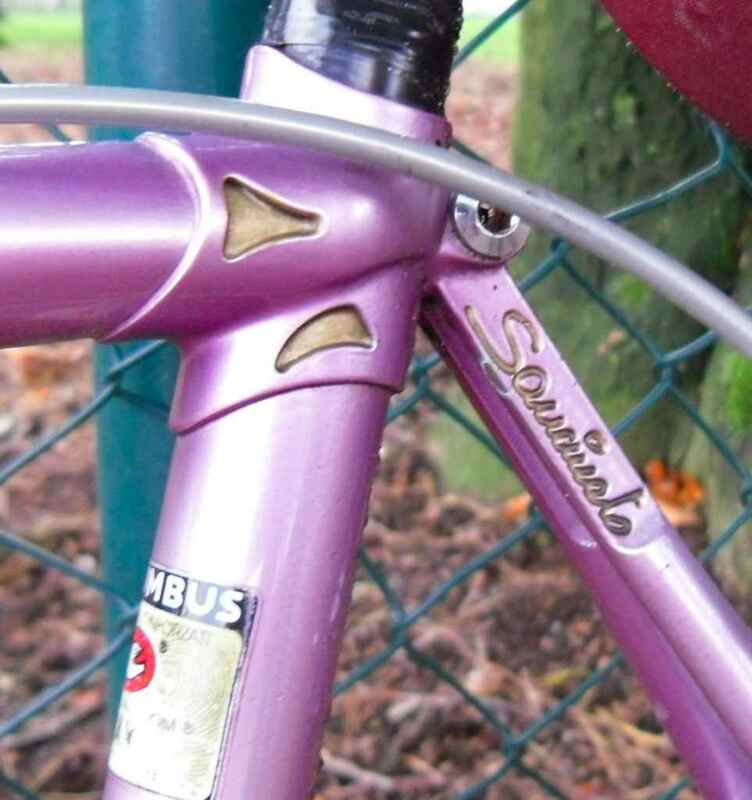 The last bike for this time is the Sancineto with some rather unusually shaped steel. Not steel framed, but seen on an autumnal ride the other day. 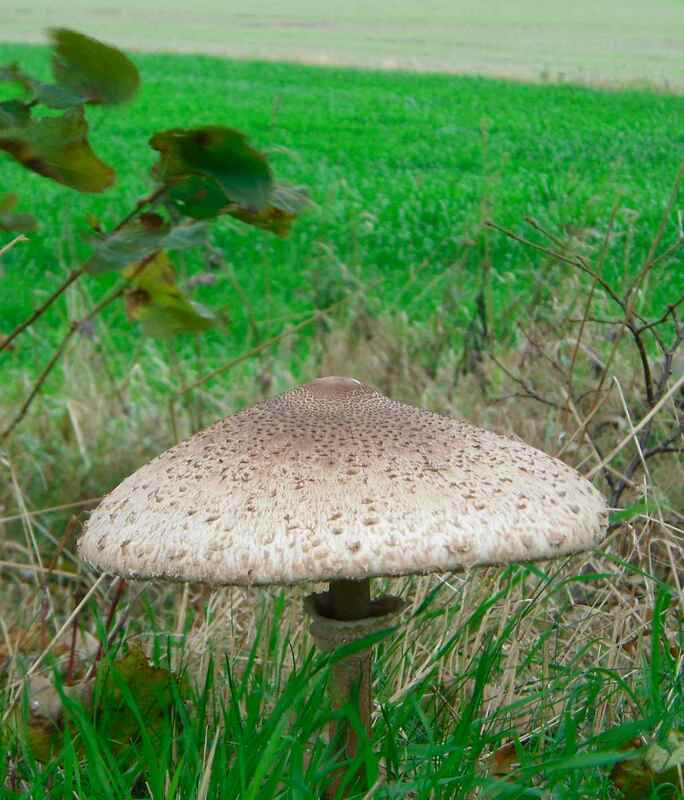 Diameter was about 25 cm. Never seen the like. 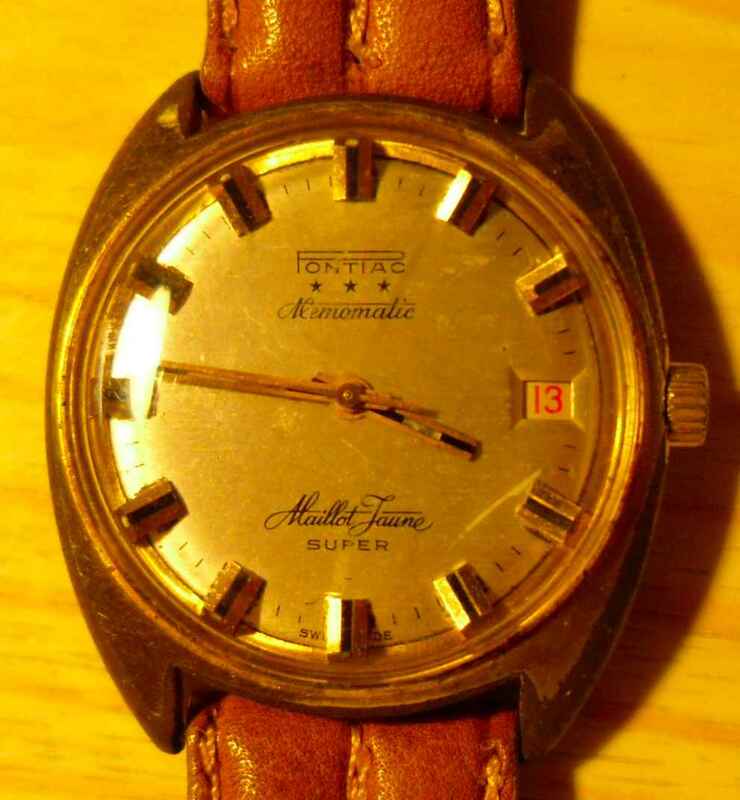 Cycleracing needs to get slower, just like this tired old watch I found in a fleamarket last Saturday. It needs less hi-tech, the equivalent of a selfwinding mechanical movement will do fine. It doesn´t need big money, again just like this watch: I paid 3 Euros for it. If that is achieved, the Maillot Jaune will become what it never was but always should have been. In short, the motorway is unnecessary because there is another one leading to more or less the same destination, and the new one would save only minutes. 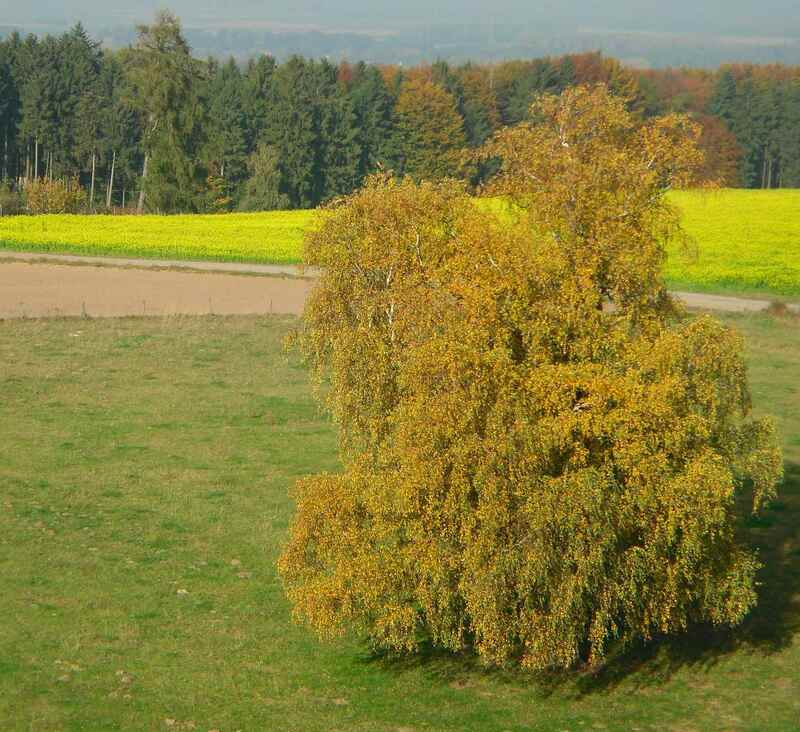 What it would do: It would lead to the destruction of a lot of valuable landscape. 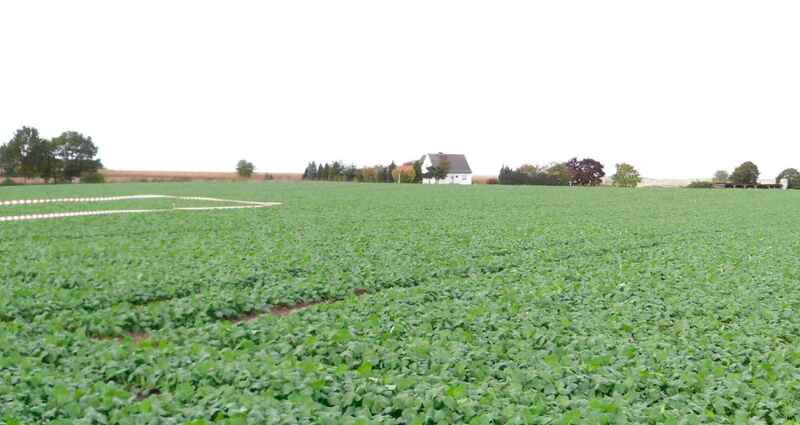 For instance, the house just about appearing in the background would vanish, just like the field as well as the hill it´s on: The view below would show thin air if the motorway would be constructed as the hill would be taken away to a depth of ca. 27ft. The two ride participants show the width of the planned motorway. Imagine the havoc it would wreak on the landscape. My Miele had been ride ready (certainly not touring ready, that came yesterday and today after some shakedown rides of about 75km in all), so I thought it might be a good idea to take it. My son took his, too, so here we were riding antiques among a crowd of 80 who didn´t notice. 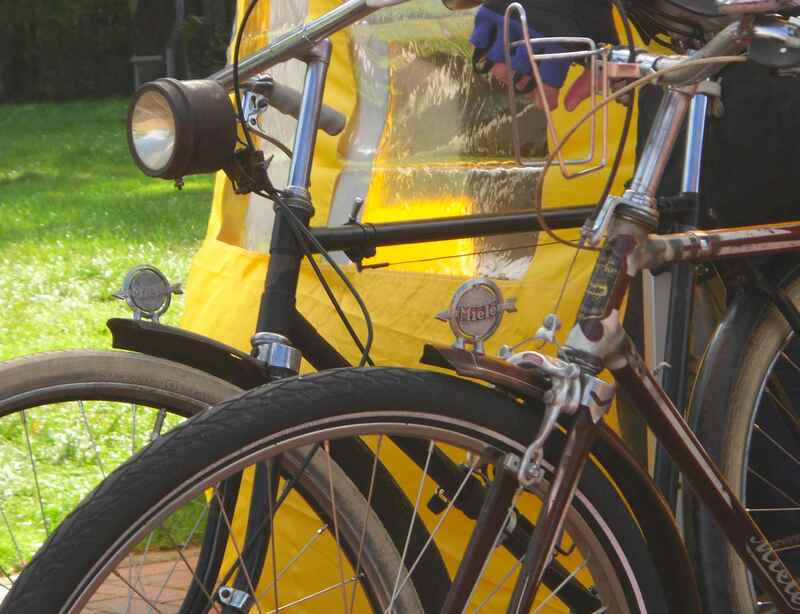 Well, one ot two did, but in general it´s quite safe to use a veteran bike in Germany – people just don´t care. I love it, firstly because it affects prices or swap values, and secondly because all famous people like some anonymity from time to time. And off we went, in two groups. There were several stops on the way. 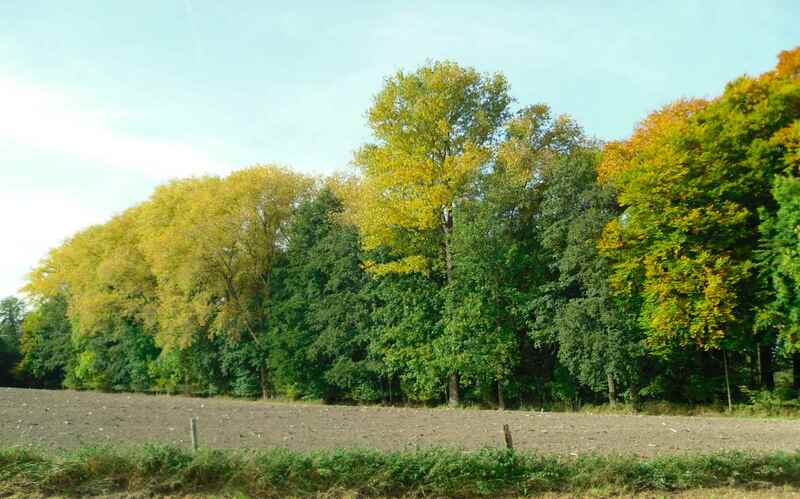 A group of activists opposed to the construction of the motorway had had the excellent idea of marking the width of the planned motorway in some fields, it being autumn and the harvest having just taken place. This for example is how close the planned motorway would come to a neighbouring village. 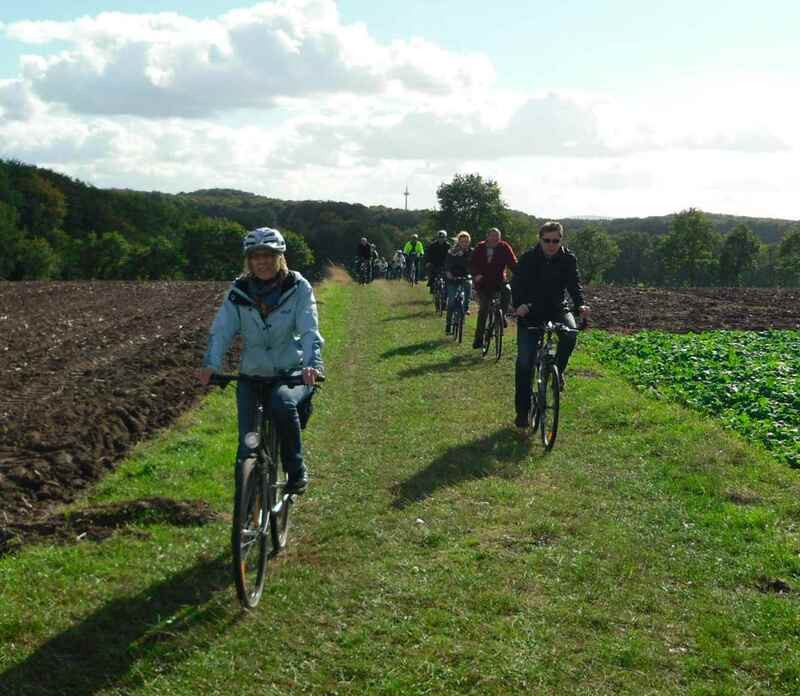 Besides discussing the motorway, we also enjoyed the wonderful weather and had fun cycling where one usually wouldn´t. 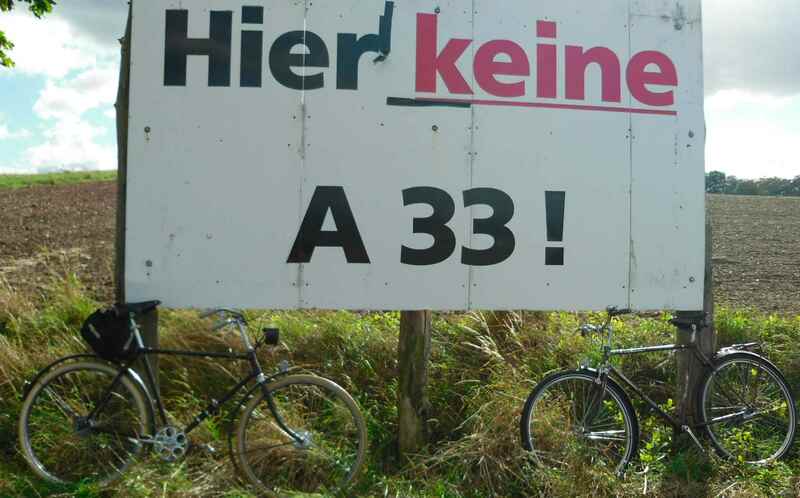 We couldn´t resist to lean our bikes to the huge sign which also is right on the planned motorway. Now some more snaps of my Miele. Its frame dates from 1930 as per a list shown on the Miele Technikgeschichte website. 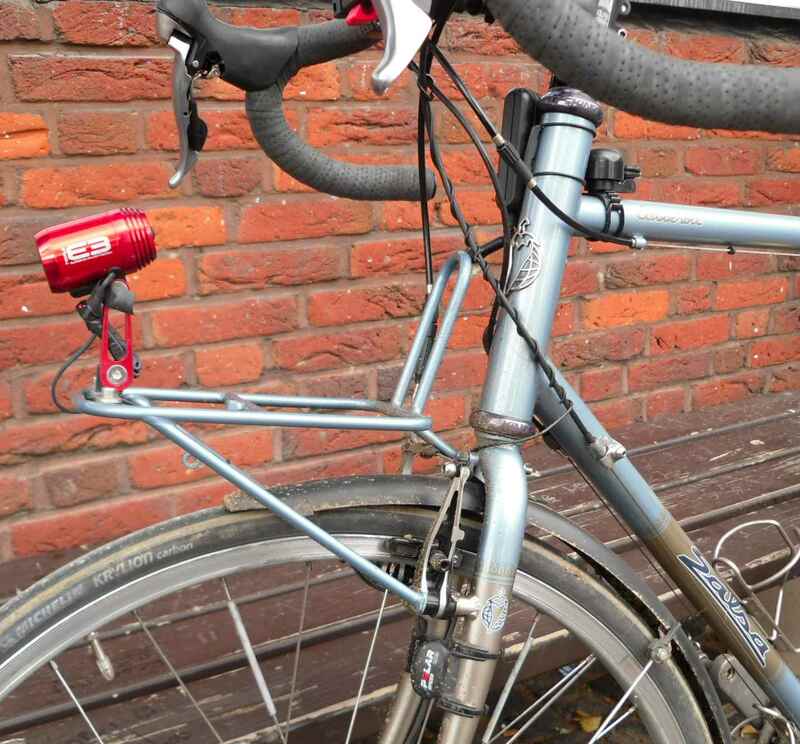 I built up the naked frame (in original paintwork) with bits which I hope are not too far off period correctness, but as I´m hoping to go on some long rides using the bike, I chose parts which are still suitable to such an undertaking. That also implies that all the parts I touch with my various body parts have been chosen according to what I need on a long ride, i.e. 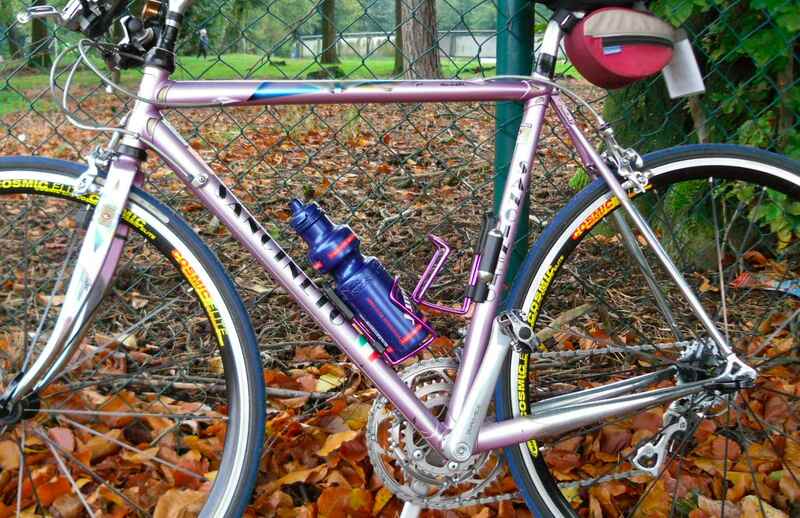 a modern Brooks saddle and Shimano SPD pedals. 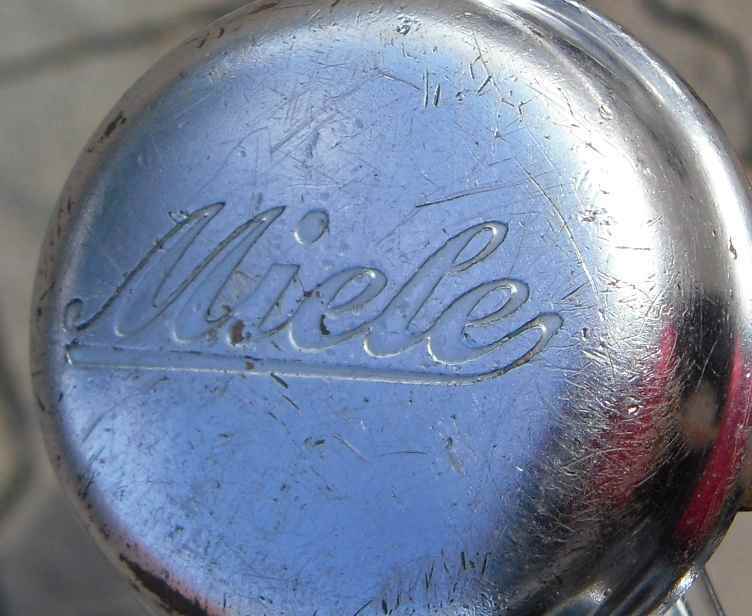 Looking at the catalogues on the Technikgeschichte website you might notice that in 1930 Miele didn´t have front mudguard mascots. 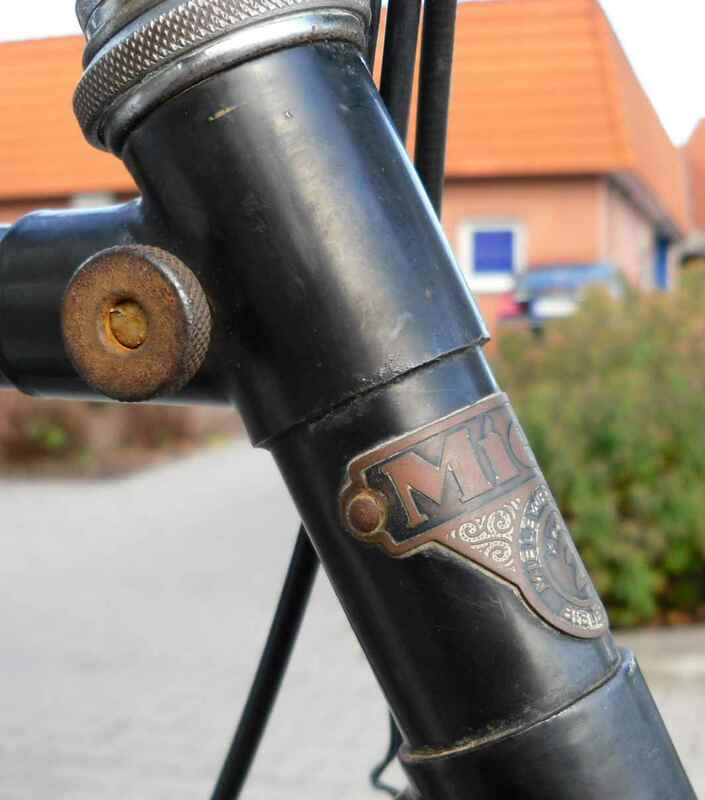 The frame came with late thirties Miele Original ´guards with a beautiful plated bronze mascot, so I kept those on. 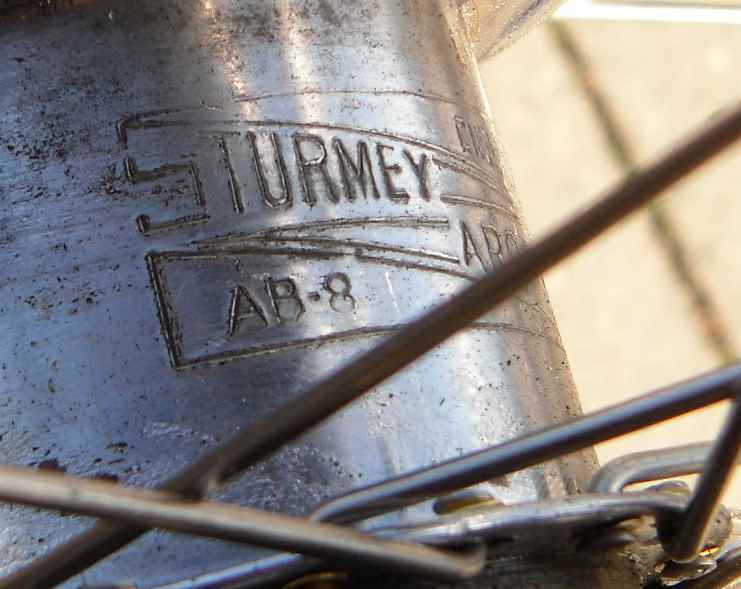 The wheels are Sturmey hubs built into wonderful Dunlop rims that had been languishing in my cellar for years. 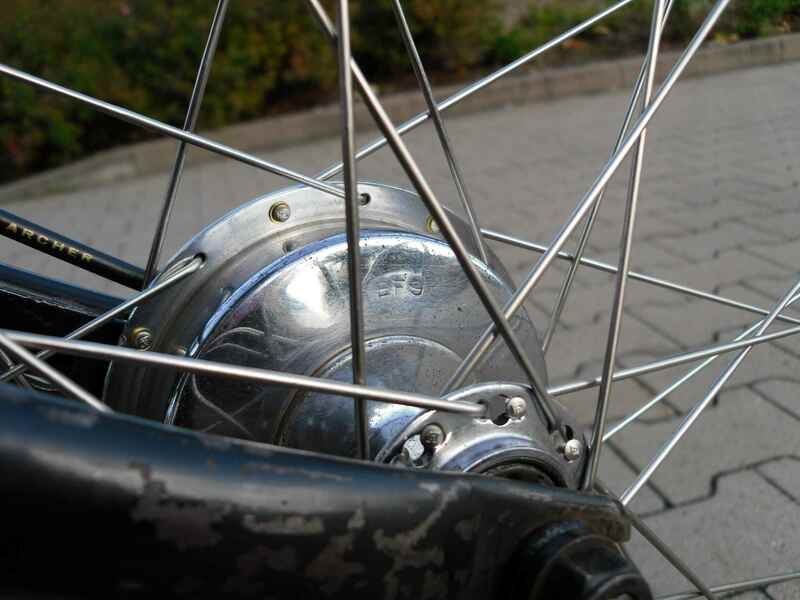 The rear is a 1938 AB three speed, the front a 1939 BF brake hub. 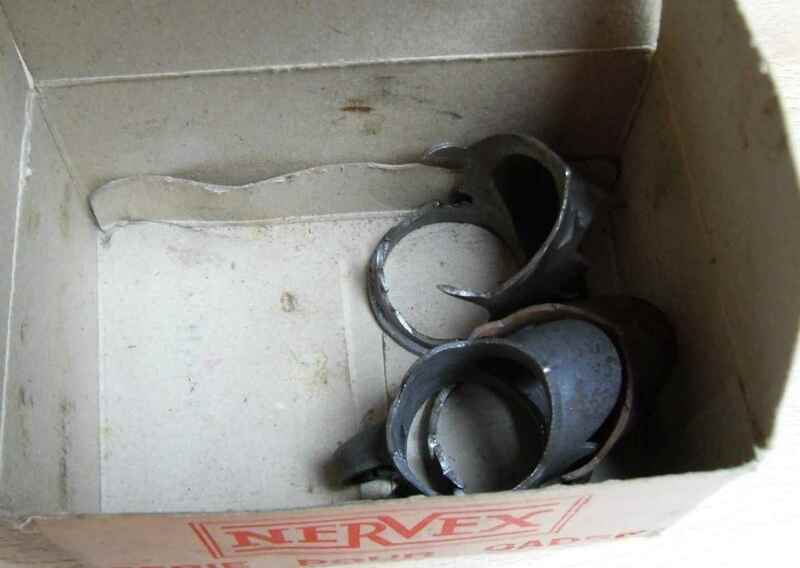 Luckily all the periphery was still in my Sturmey box, including the plastic covered quadrant length gear cable. 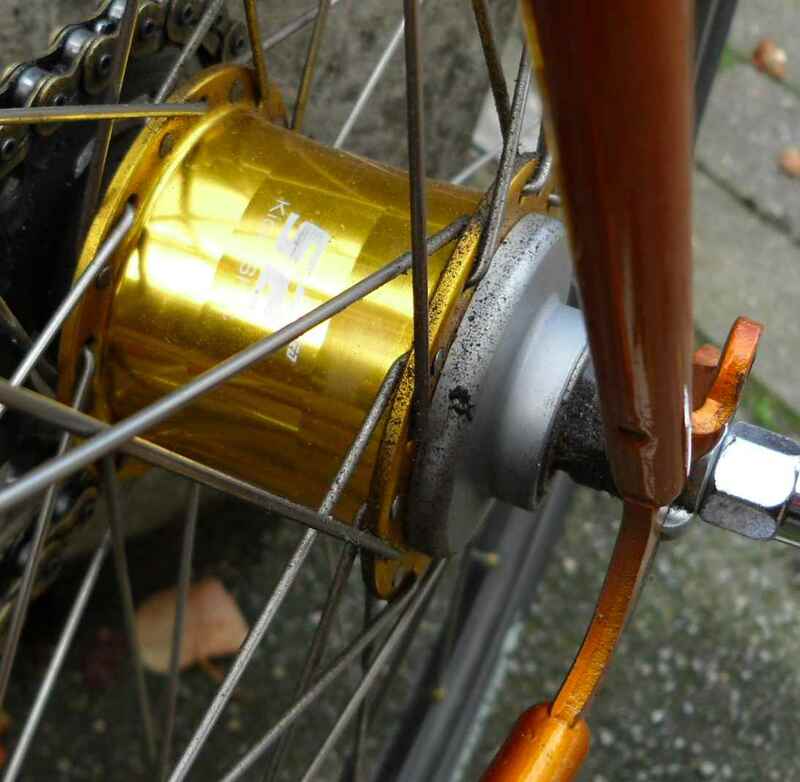 Yes, there are brass washers under the spoke heads, and I wish I had taken two per spoke. 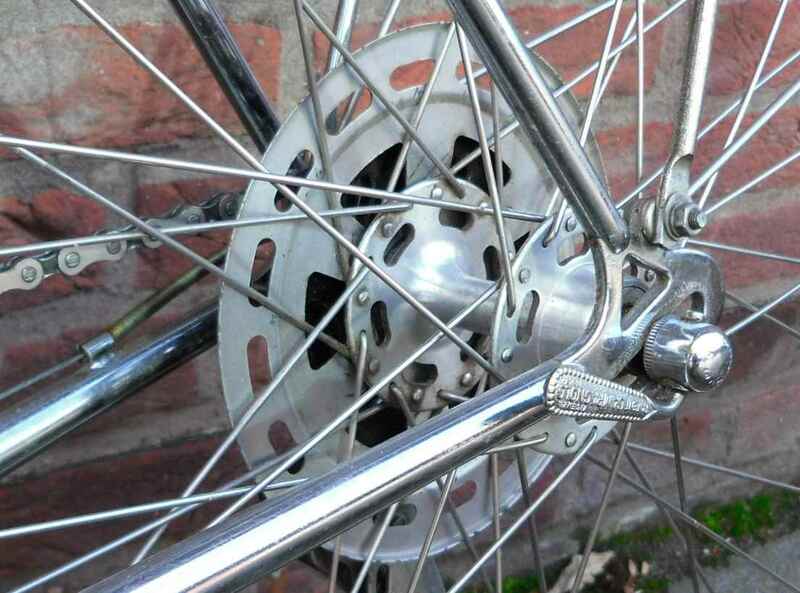 Those Sturmey flanges have always been very thin, not a good idea for modern spokes made for alloy flanges. Let´s hope for the best. And yes, as soon as I´ll be certain I won´t have to change anything about the wheels I´m ging to tie and solder them, too. Here´s the typical Miele five circle chainwheel. 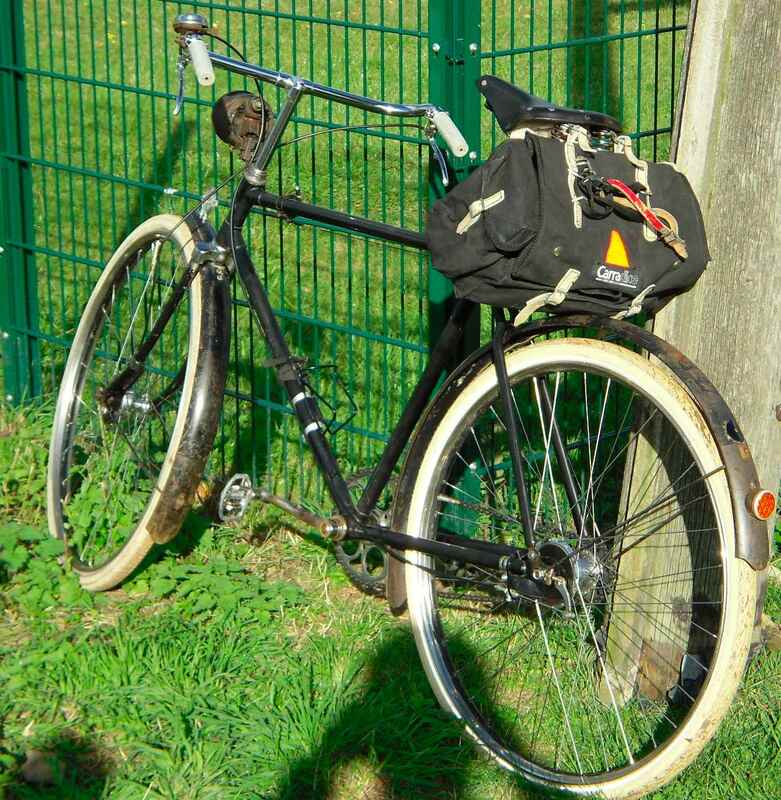 This one has 47 teeth and will lead to me using a 28 theeth sprocket so that I can use top as my standard gear (still a lot of inches with a Sturmey three speed and 40 x 635 tyres…) and I´ll have two lower ones for the wind and the hills. 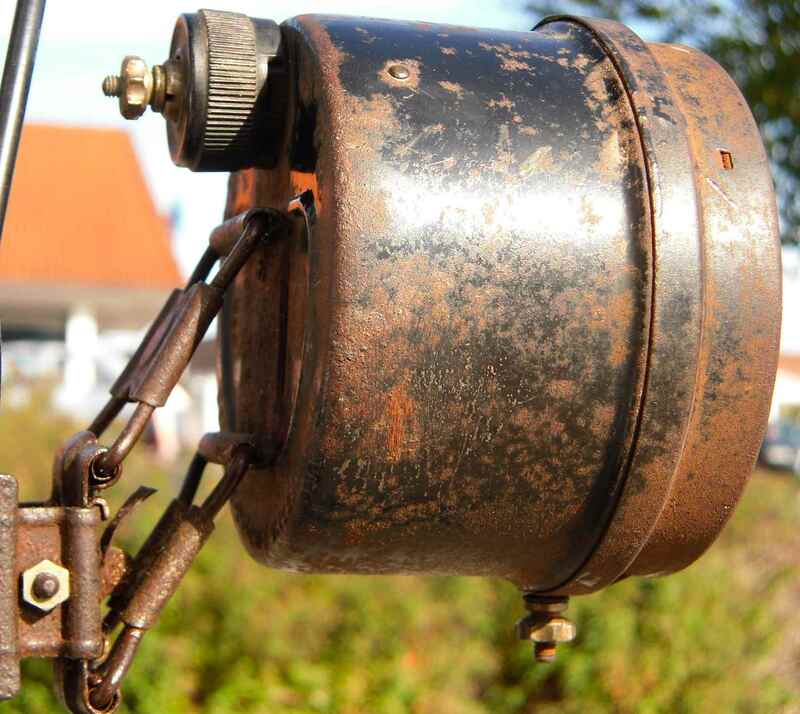 This beauty is a Bosch battery lamp and came off a bog standard flea market about two years ago, and a rather moderate price at that. It fits perfectly to the somewhat rough appearance of the rest of the bike. Need to get a battery to see if it works. 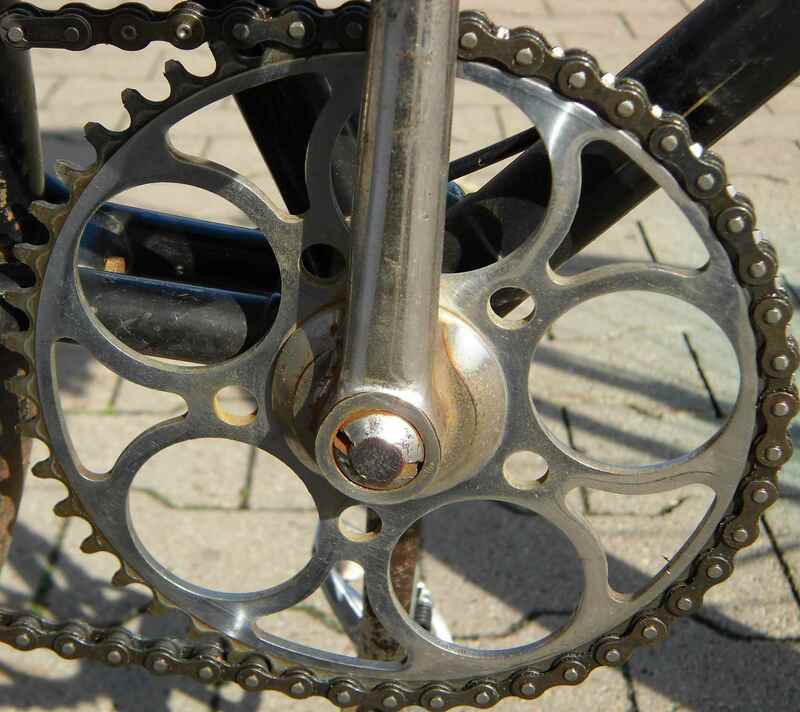 The Sturmey quadrant. I do have a late thirties trigger marked “Patent Applied For”, but I just couldn´t resist the show effect of the quadrant. And, actually, after only a few kms one gets used to it. 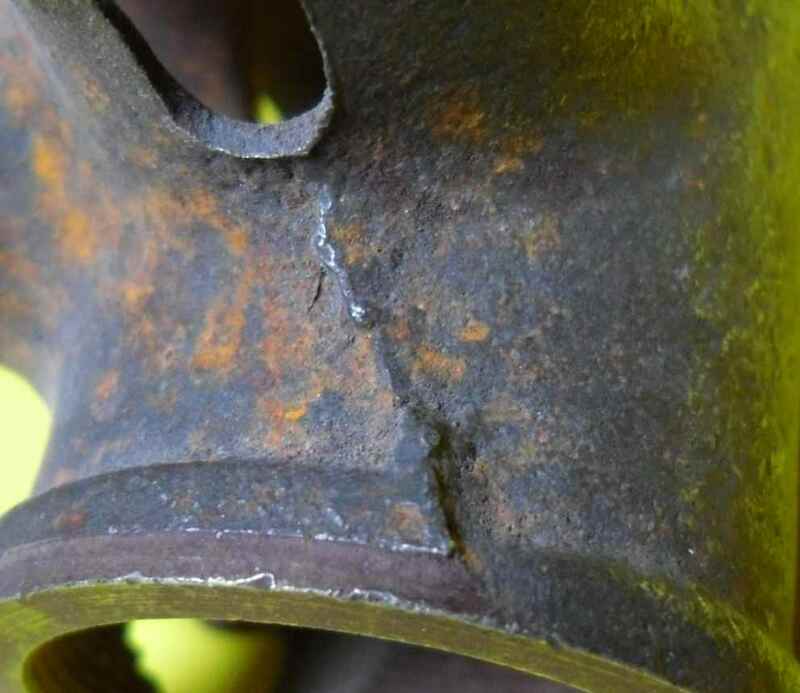 The nickel plating has worn away to show the copper layer under it. Here´s the front end of the frame. 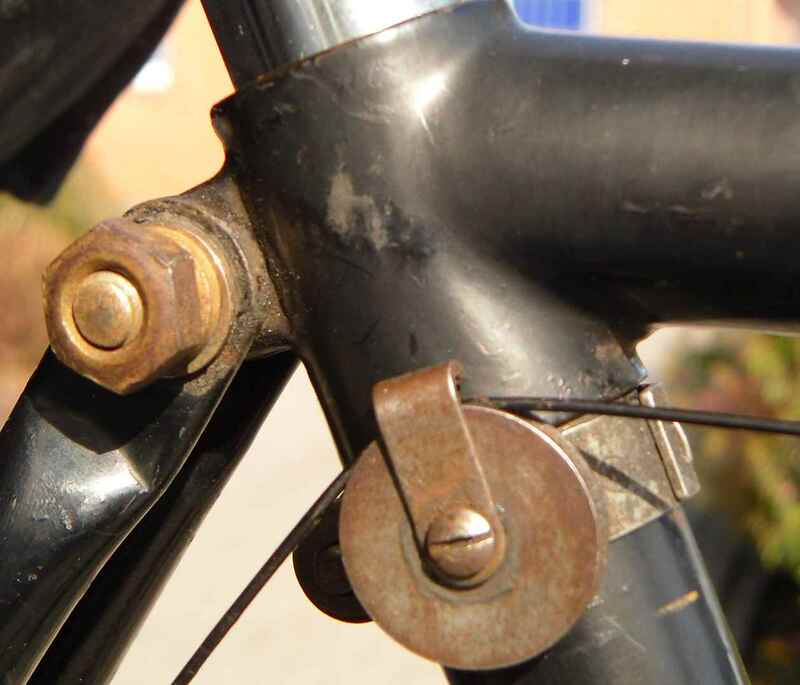 The knob is a steering damper knob: You twist it, and a threaded bolt will pull a metal band round the fork column. It´s a boon on bad roads of which Germany still had a lot in the 30s. 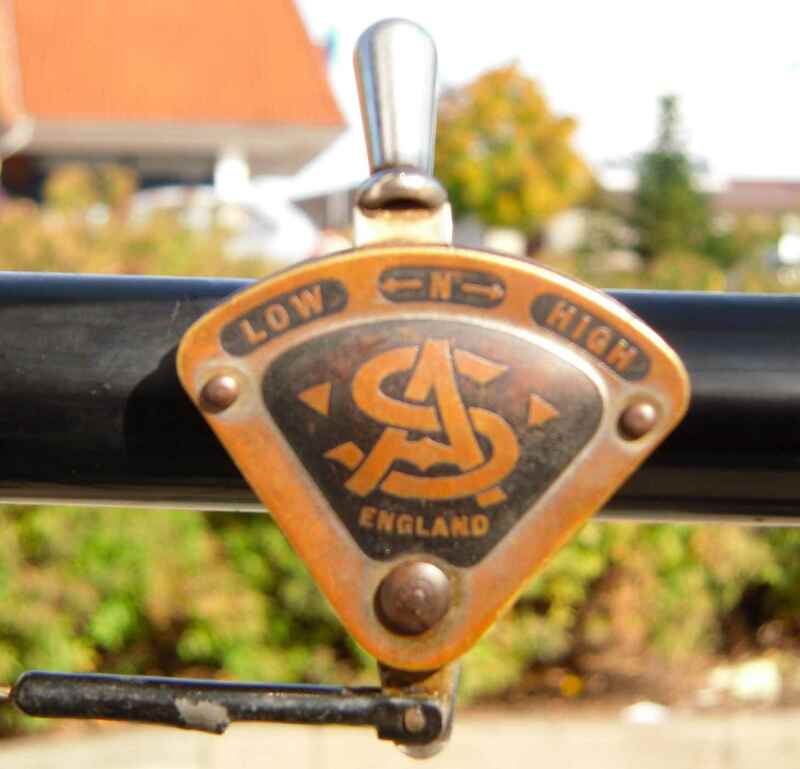 It´s also a sure sign of a pre-WWII German quality bike; post WWII only Triumph in Nuremberg made them, AFAIK. There´s a better snap of the rare headbadge in the “Teaser” post. 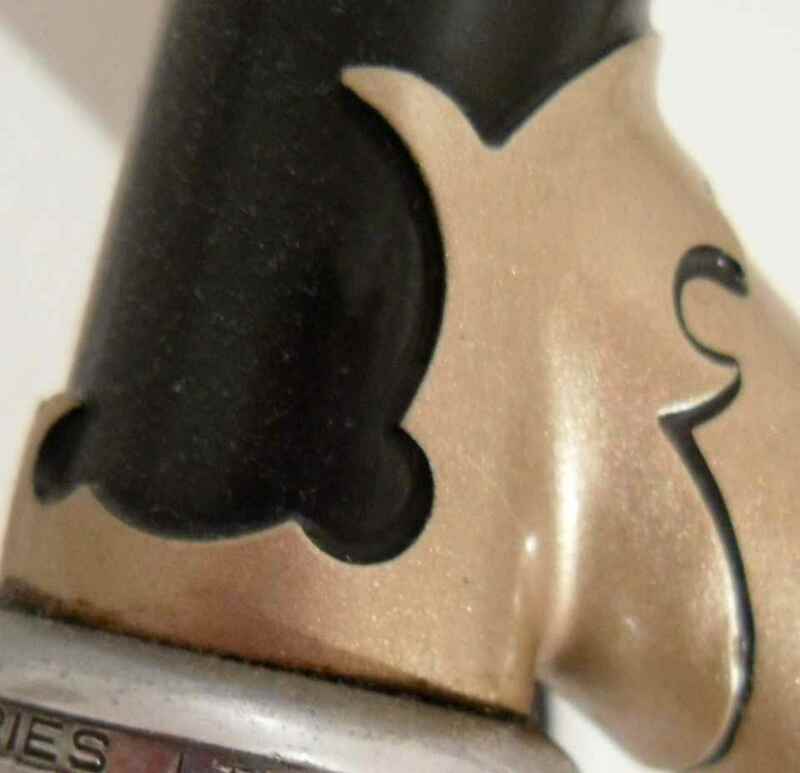 I have seen more elaborate lug scrollwork, but it seems to have worked for the last 82 years, so, please, tubes, keep going for a few more years. Where do you look first if you meet a bike for the first time? What´s its face? 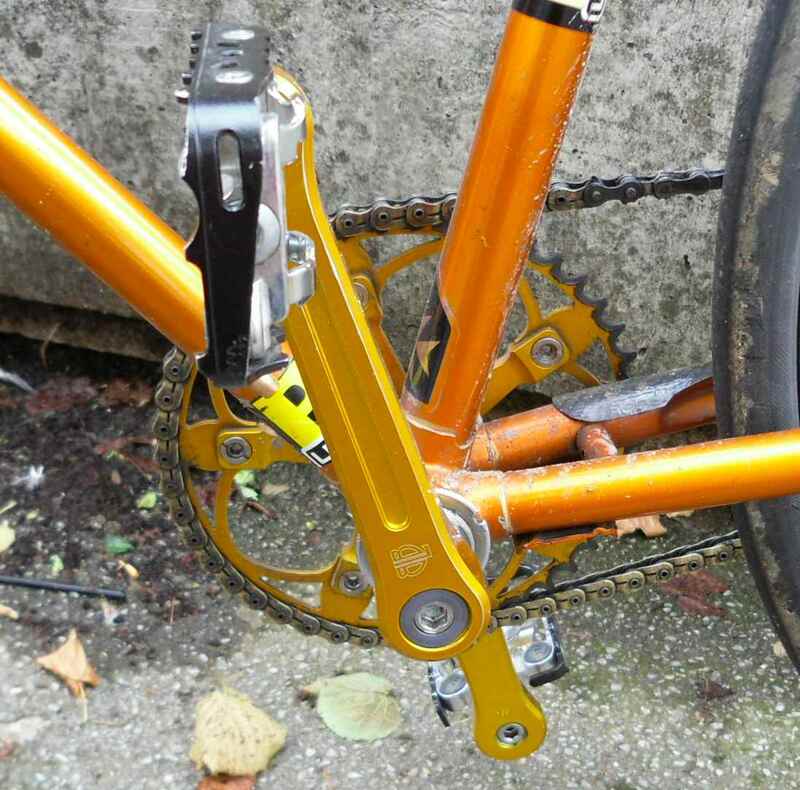 I know some people who look at the crankset, the rear derailleur, the saddle, even the fork crown. 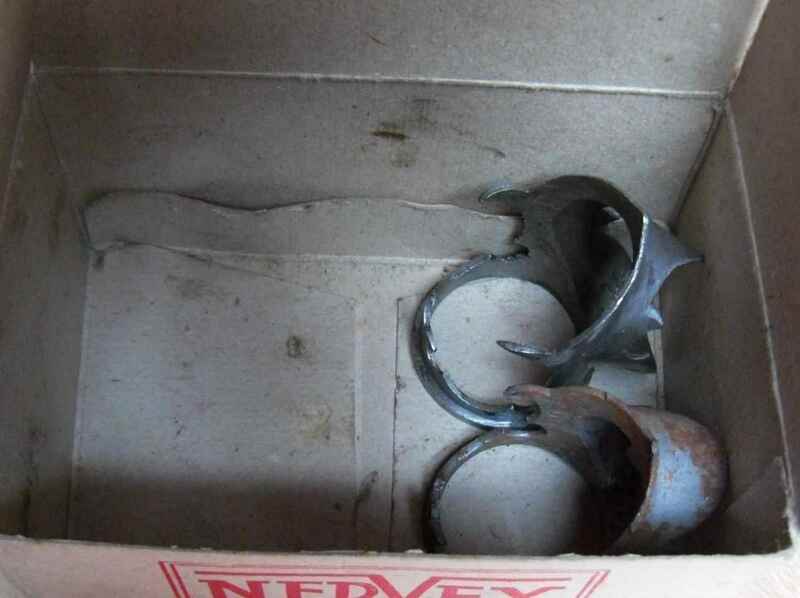 What I look at are the headlugs. Here´s why. 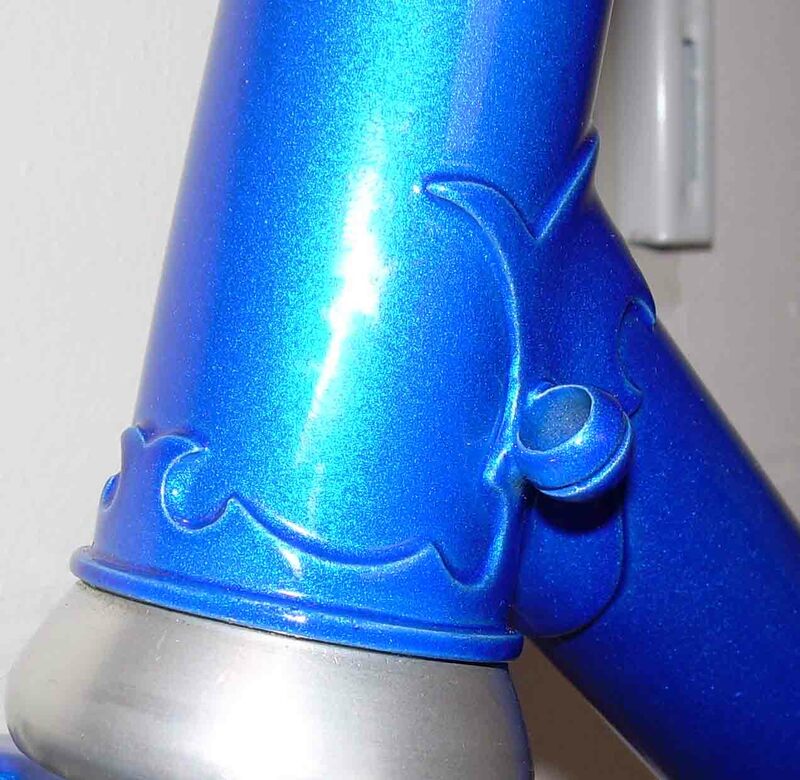 I don´t see anything personal in a bike which is welded, bilaminated or has no lugs for some other reason. 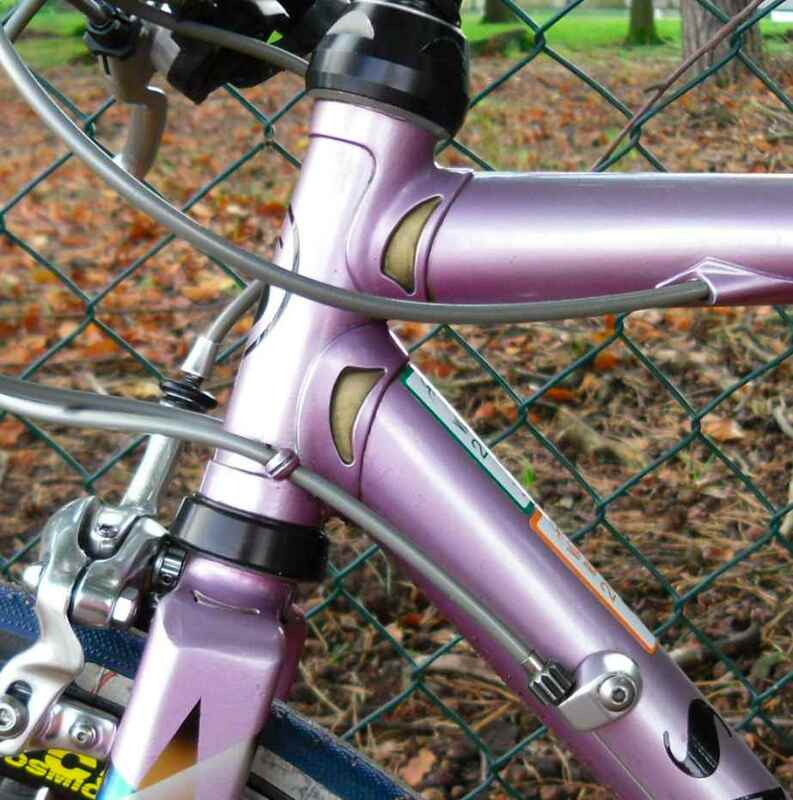 Next come bikes with modern spearpoint lugs, nicely curved, possibly filed paper thin, but still – not much personality. 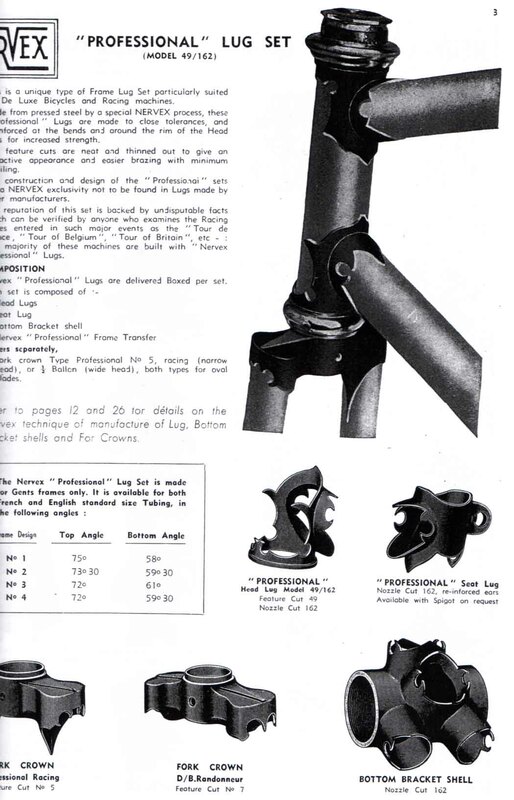 The next rung up on the ladder to a fully personal bike is a nice ready made scrolly headlug, like a Nervex Professionnel. 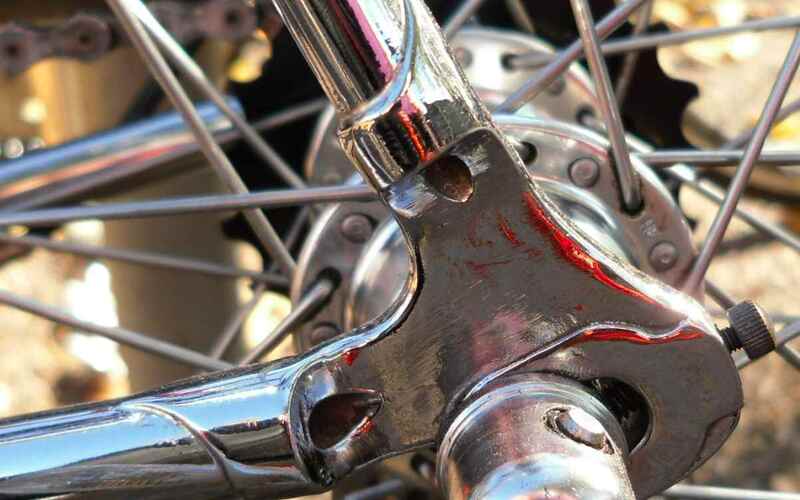 Lastly for the uninitiated there is only little discernible difference, but in reality there is a huge step in craftsmanship to the pinnacle of lugged bikes: The ones that have handmade lugs, possibly made to order of the first owner. A good example of this are my two Thanet Silverlights, both already posted, showcasing an “S” and a “T” in the headlugs. Someone worked away only a little to ferociously, and the thing was spoilt: Sawed too far. 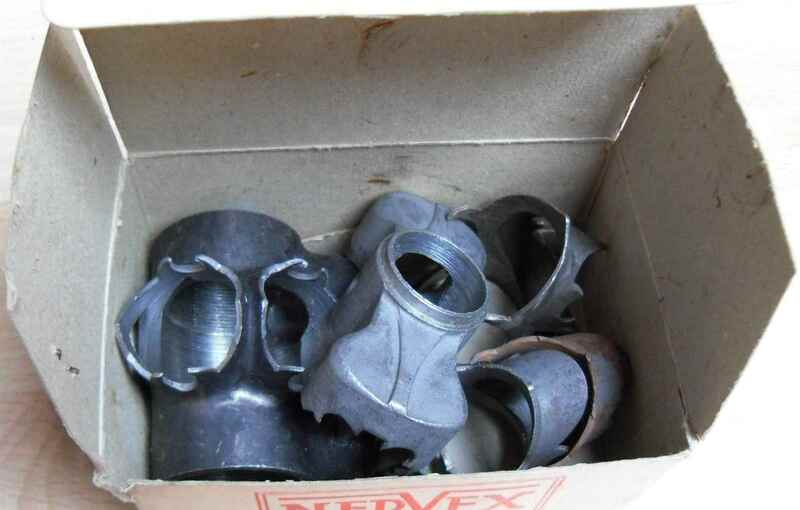 All of these parts were salvaged from Köthke´s Cologne workshop when it was closed down. They are pre-WWII and survived the bomb raids of the 1940s. 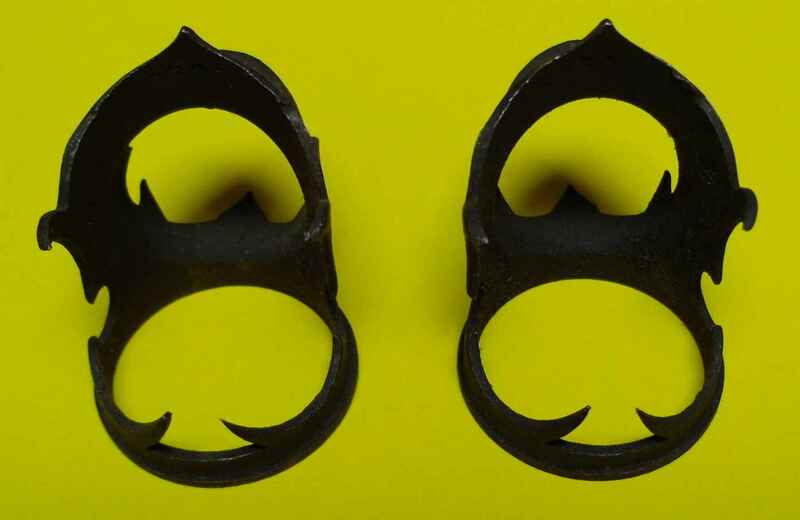 It´s a quirk of fate that old Köthke made bike frames from British bits in his Niederichstraße workshop during the day, and must have spent many nights in the shelter while British bombs rained down on Cologne. 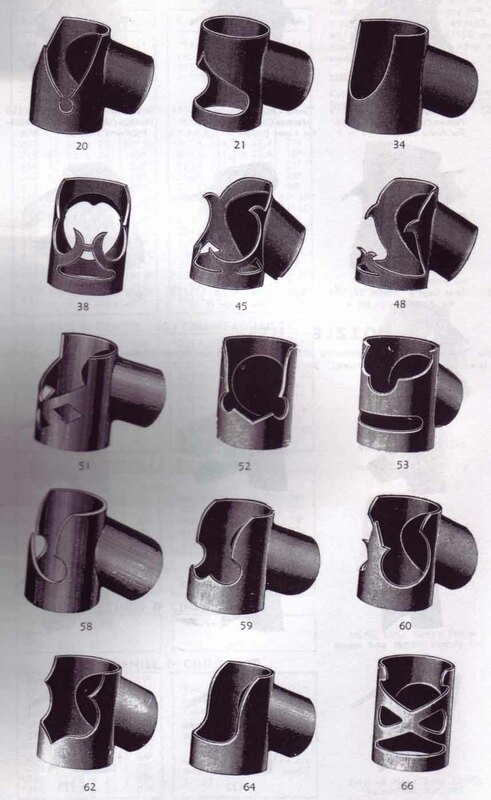 Many framebuilders were overjoyed when shortly after the war French firm Francolam came up with a wide choice of ready made lugs that looked handmade and were available in a number of designs. 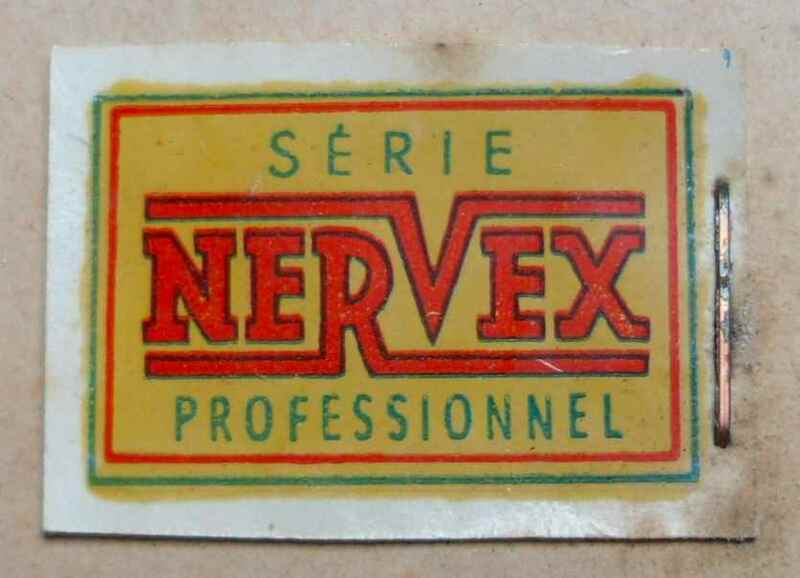 This is the page in their 1958 catalogue presenting the top-of-the-line Professionnel series, their cheaper line being called Série Légère. The catalogue is a reprint bought at velo-retro from Chuck Schmidt who has a marvellous choice of old bicycle related catalogues. I didn´t want to damage my copy, so scans are somewhat incomplete. 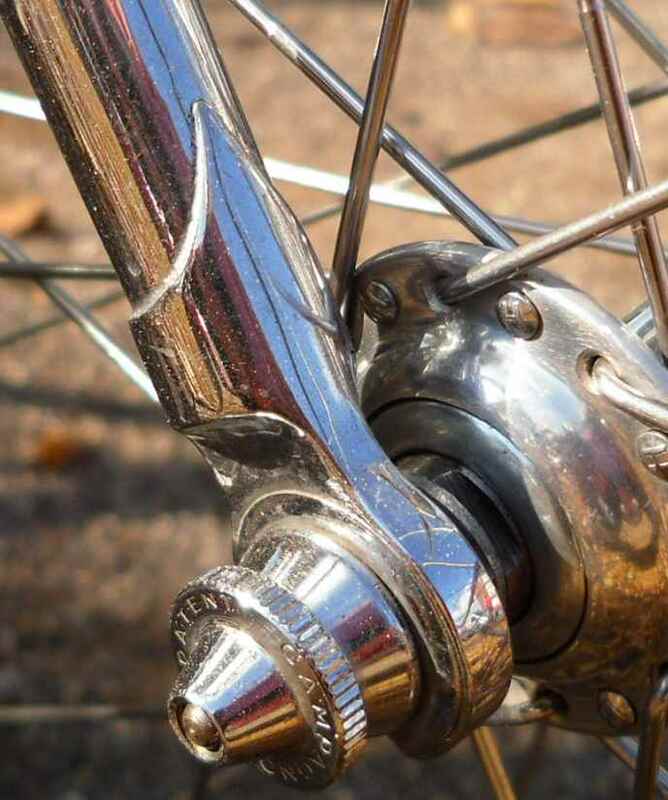 The feature cuts on Série Légère lugs might ring a few bells with someone. Here´s a small selection from Francolam´s huge choice. “Série pour cadre” means (lug) set for frame, BTW. Opening the flap, a neat little transfer was what first met the eye. Sure, the lugs were not free from burrs and needed some time spending on them, but the frame builders I asked said they loved them. 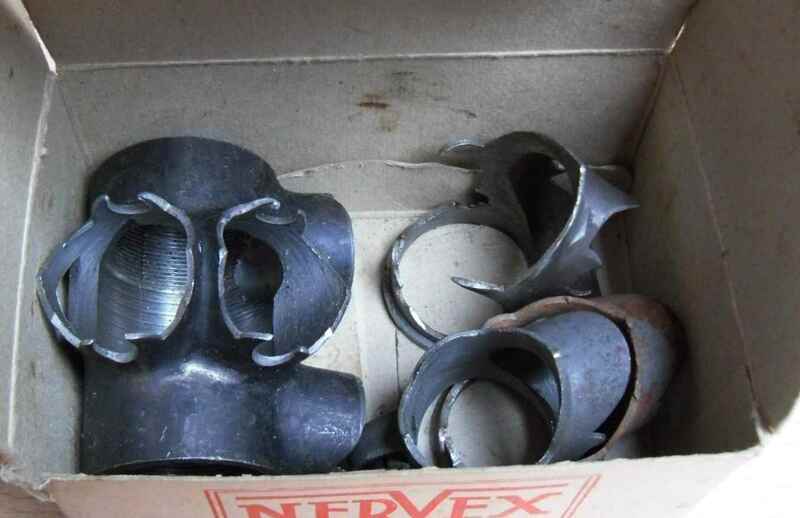 There were some lugs that could not be saved by any amount of time spent on them, though. 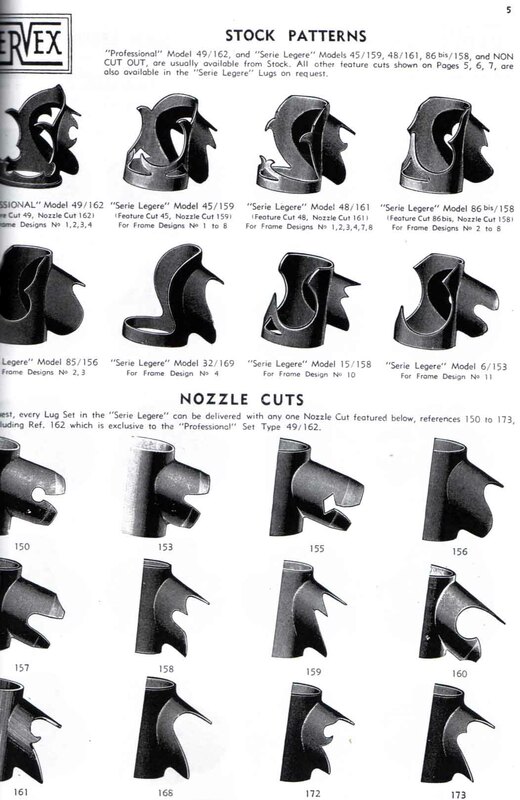 The first model Professionnel had a different feature cut from the second one; they used thin upwards sweeping half crescents. 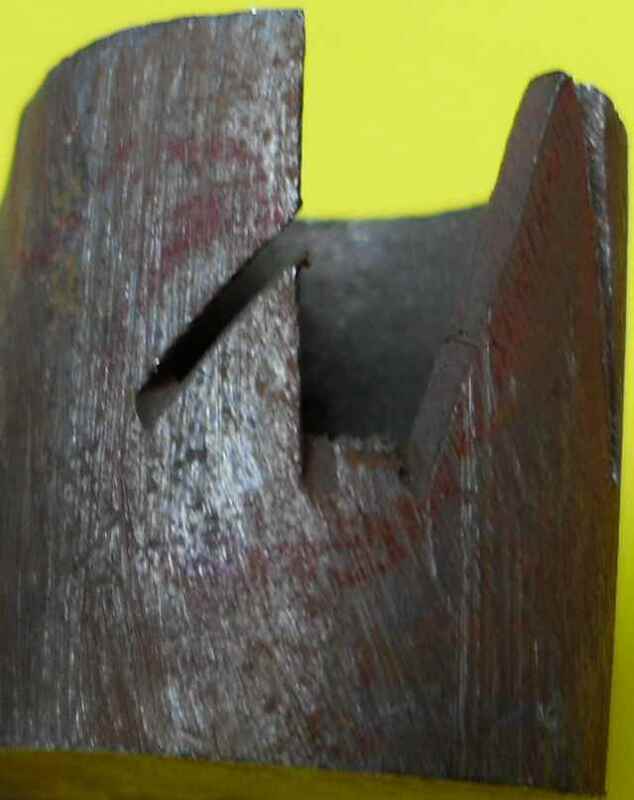 In the left hand lug you can see that the right hand side crescent is too thin – the stamping machine that made this lug was not operated skillfully enough. 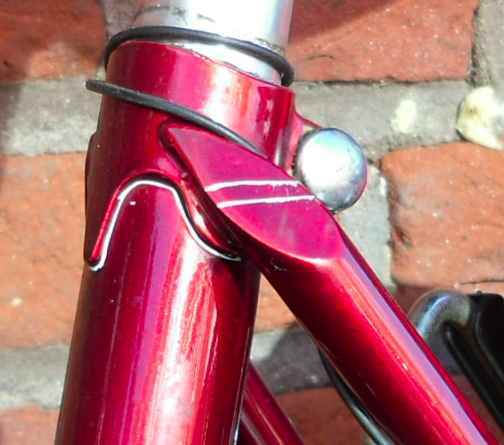 Something else E-B have been doing for ages is that they take off the original cheapish looking seatlug eyes that accomodate the binder bolt and replace them with threaded eyes of their own production, brazing them on in a breathtakingly clean line. 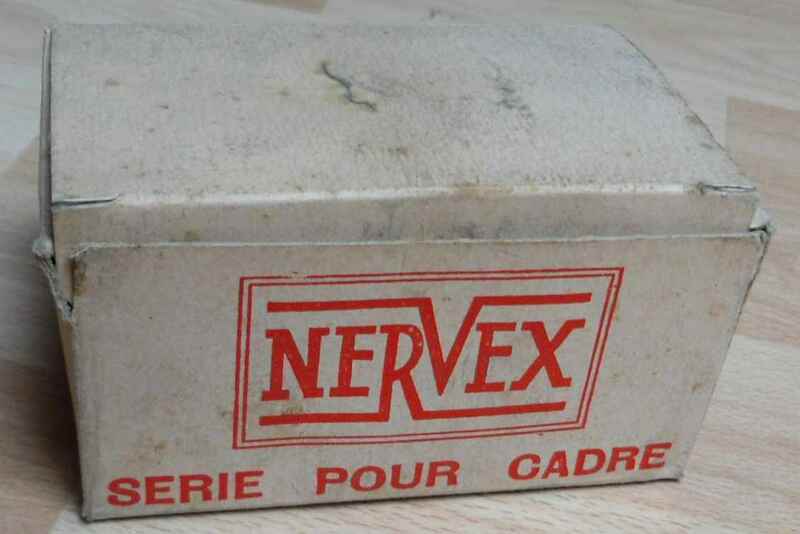 The original Nervex eyes will only last forever (unless they are misused), but that isn´t enough for E-B. Their eyes last forever and a day, and look beautiful too. 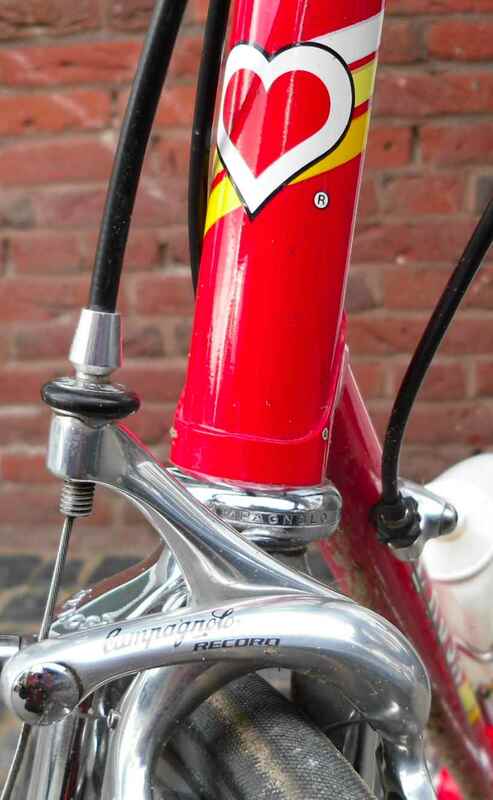 Here´s the other side on the 1980s frame. 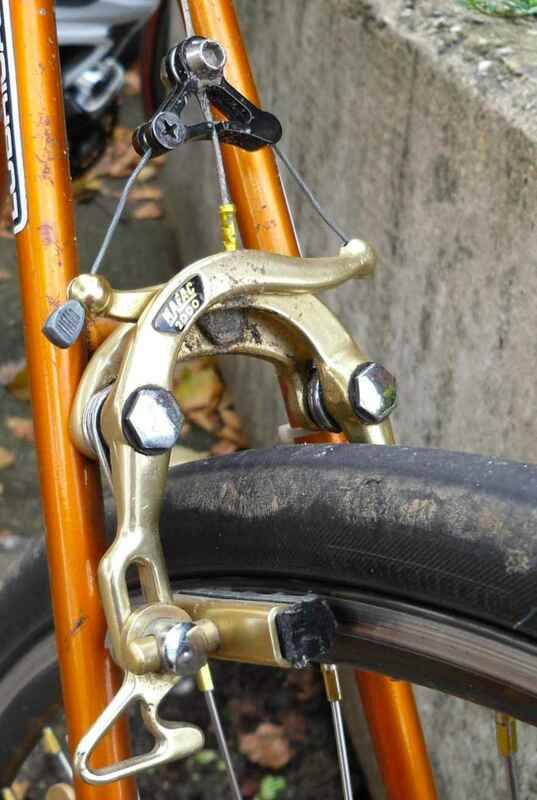 Lastly, here´s a seriously beautiful idea: The fastback seatstays receive a lug that imitates Nervex design. Who´s it by? Have a guess. 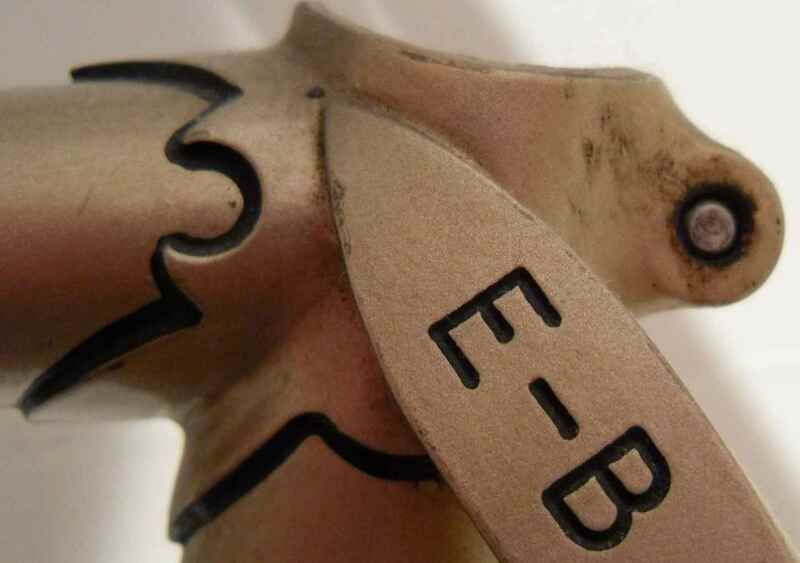 The name starts with an Ellis and ends in a Briggs. 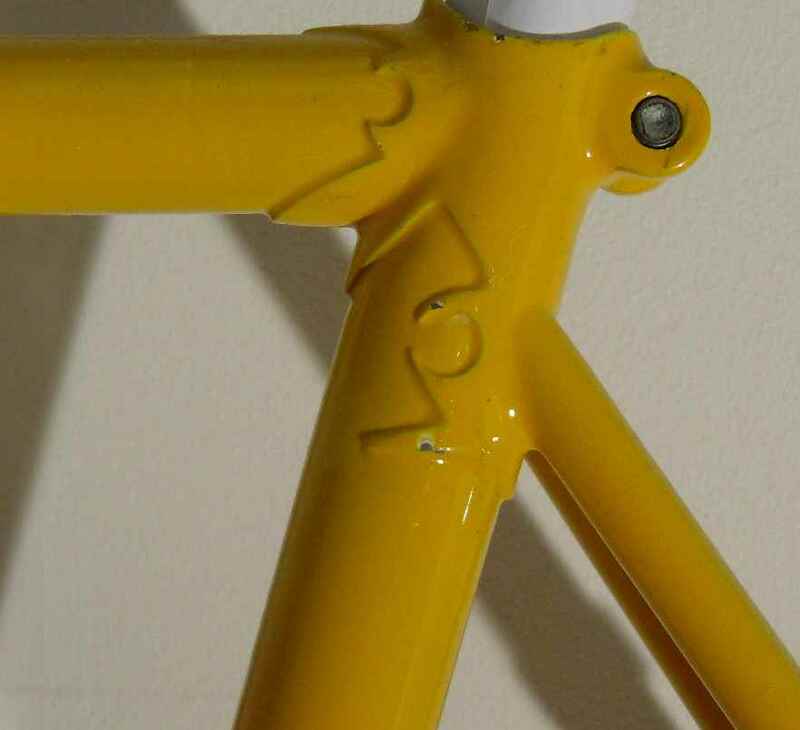 Unluckily, this 1978 frame is not in its original livery, but the original champagne colour isn´t exactly my favourite one.